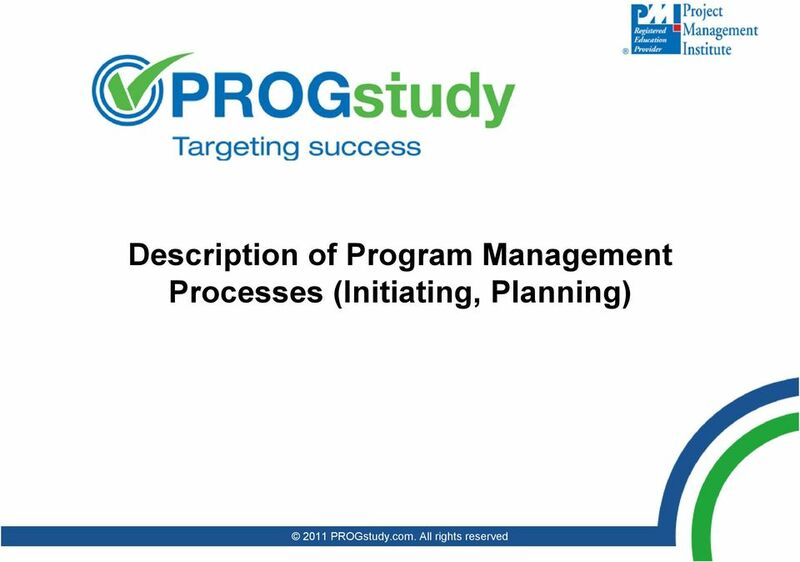 Download "Description of Program Management Processes (Initiating, Planning) 2011 PROGstudy.com. All rights reserved"
3 Summary of Program Management Process Groups There are five Program Management Process Groups (briefly discussed below, and covered in detail in next chapter) Initiating Process Group: This defines and authorizes the program or a project within the program Planning Process Group: This describes the best alternative courses of action to deliver the benefits of the program Executing Process Group: This integrates projects, people, and other resources to carry out the plan for the program and deliver the program's benefits. Monitoring and Controlling Process Group: This requires that the program and its component projects be monitored against the benefit delivery expectations and appropriate corrective actions taken if necessary. 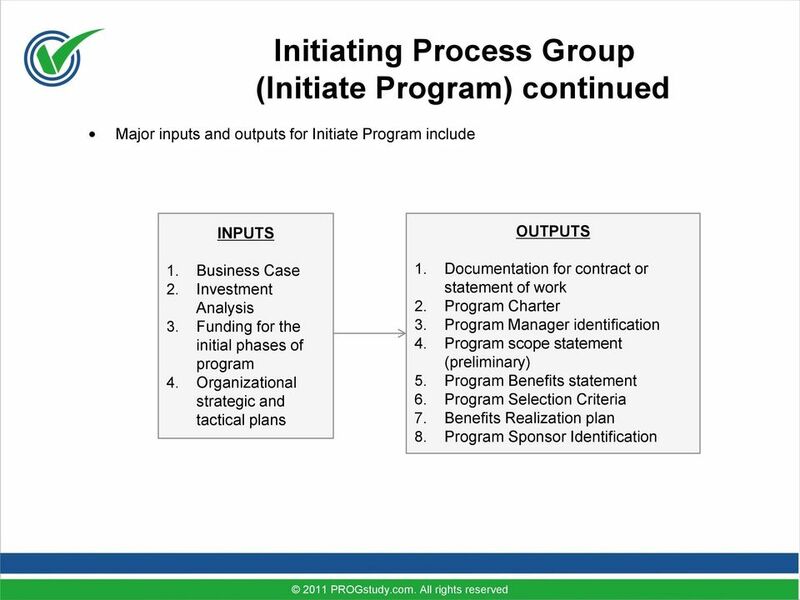 Closing Process Group: This formalizes acceptance of a product, service, or benefit and brings the program to an orderly end. 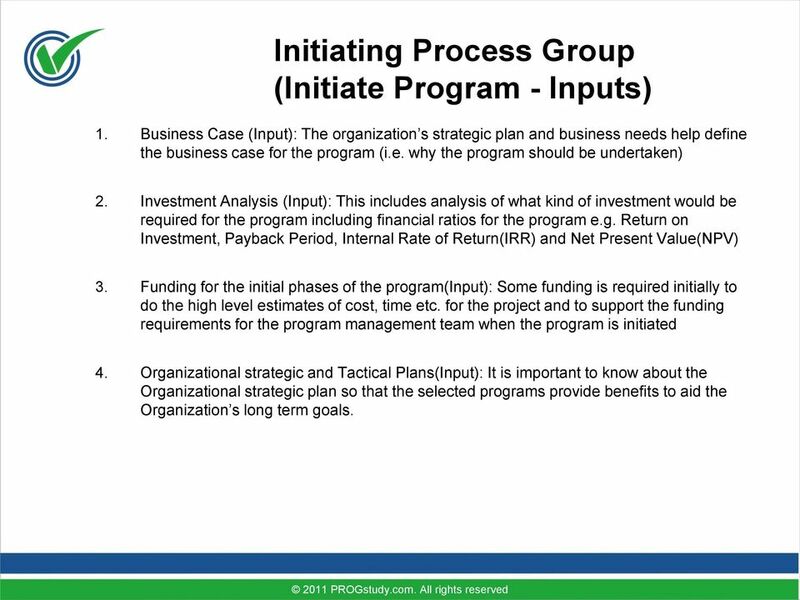 7 Initiating Process Group (Initiate Program - Inputs) 1. Business Case (Input): The organization s strategic plan and business needs help define the business case for the program (i.e. why the program should be undertaken) 2. Investment Analysis (Input): This includes analysis of what kind of investment would be required for the program including financial ratios for the program e.g. Return on Investment, Payback Period, Internal Rate of Return(IRR) and Net Present Value(NPV) 3. Funding for the initial phases of the program(input): Some funding is required initially to do the high level estimates of cost, time etc. for the project and to support the funding requirements for the program management team when the program is initiated 4. Organizational strategic and Tactical Plans(Input): It is important to know about the Organizational strategic plan so that the selected programs provide benefits to aid the Organization s long term goals. 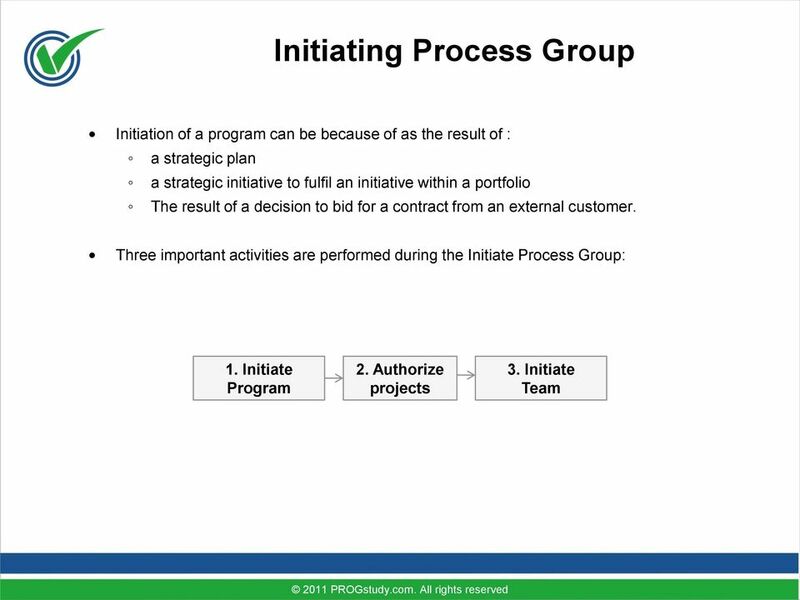 8 Initiating Process Group (Initiate Program - Outputs) 1. Documentation for contract or statement of work (Output): If some work for the program is going to be done as part of a contract, the documentation for the contract or statement of work will be an output from this process and will define the work which will be contracted to an external vendor 2. 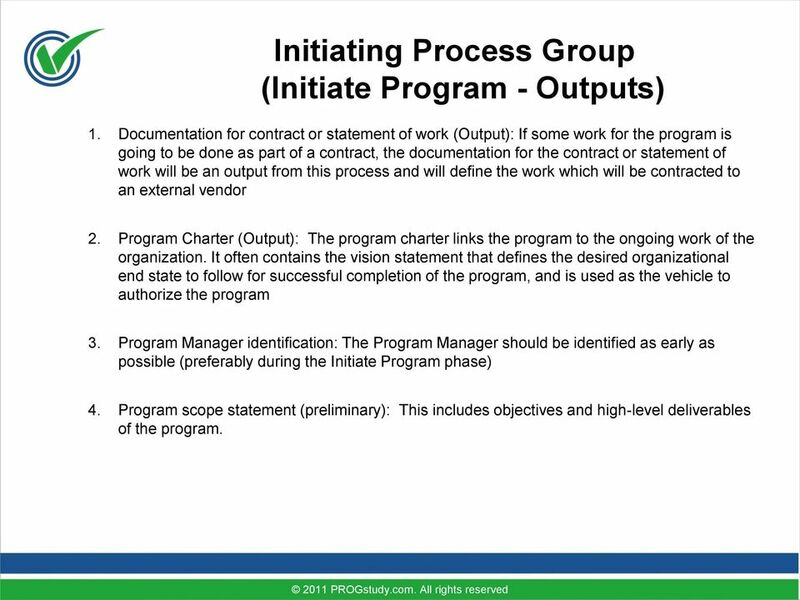 Program Charter (Output): The program charter links the program to the ongoing work of the organization. It often contains the vision statement that defines the desired organizational end state to follow for successful completion of the program, and is used as the vehicle to authorize the program 3. 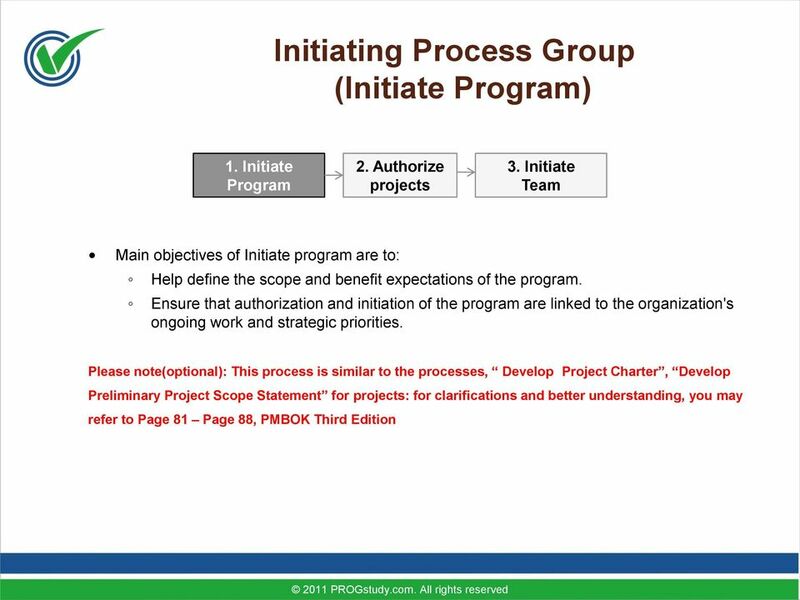 Program Manager identification: The Program Manager should be identified as early as possible (preferably during the Initiate Program phase) 4. Program scope statement (preliminary): This includes objectives and high-level deliverables of the program. 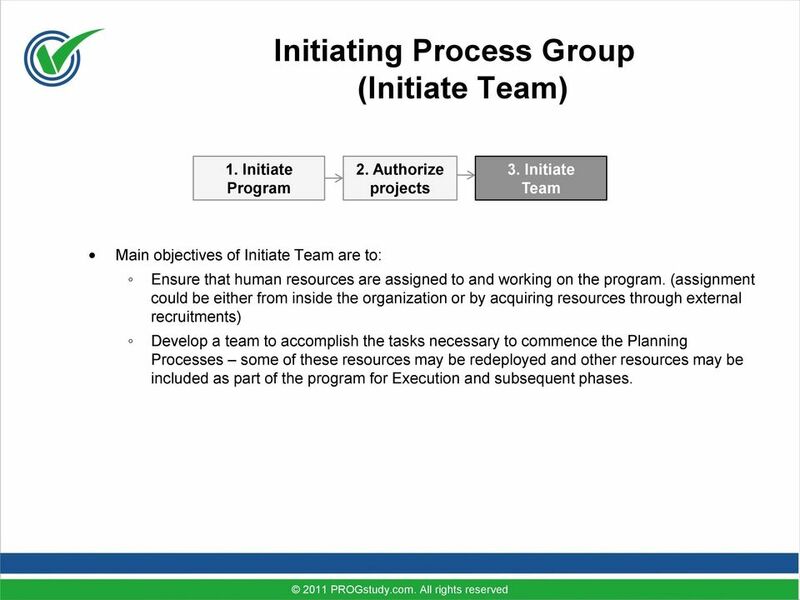 9 Initiating Process Group (Initiate Program - Outputs) 5. 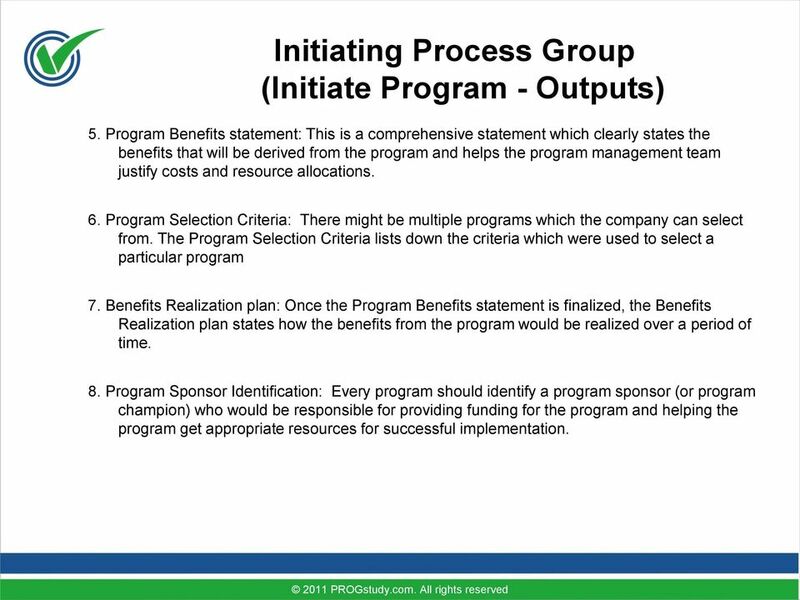 Program Benefits statement: This is a comprehensive statement which clearly states the benefits that will be derived from the program and helps the program management team justify costs and resource allocations. 6. Program Selection Criteria: There might be multiple programs which the company can select from. The Program Selection Criteria lists down the criteria which were used to select a particular program 7. Benefits Realization plan: Once the Program Benefits statement is finalized, the Benefits Realization plan states how the benefits from the program would be realized over a period of time. 8. Program Sponsor Identification: Every program should identify a program sponsor (or program champion) who would be responsible for providing funding for the program and helping the program get appropriate resources for successful implementation. 12 Initiating Process Group (Initiate Team) 1. Initiate Program 2. 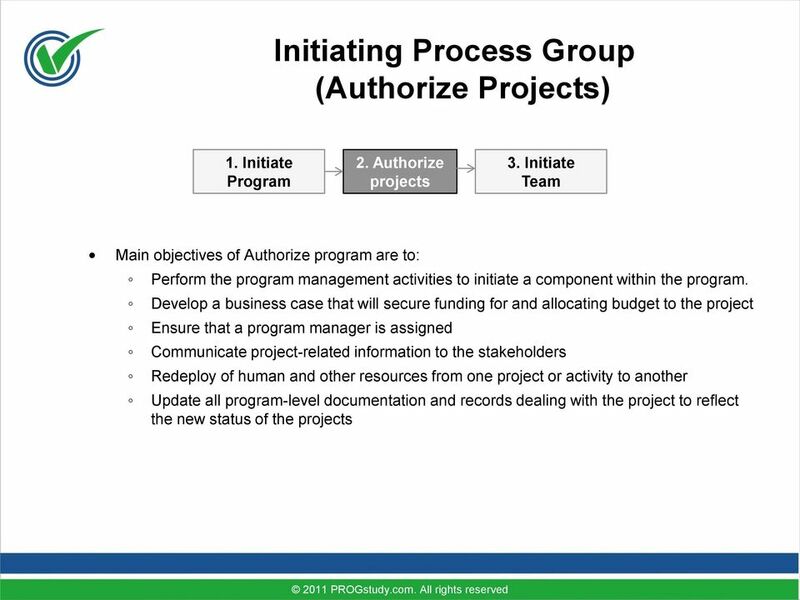 Authorize projects 3. Initiate Team Main objectives of Initiate Team are to: Ensure that human resources are assigned to and working on the program. (assignment could be either from inside the organization or by acquiring resources through external recruitments) Develop a team to accomplish the tasks necessary to commence the Planning Processes some of these resources may be redeployed and other resources may be included as part of the program for Execution and subsequent phases. 14 Planning Process Group The Planning Process Group contains the processes needed to determine how the program will be implemented and position it for successful execution. 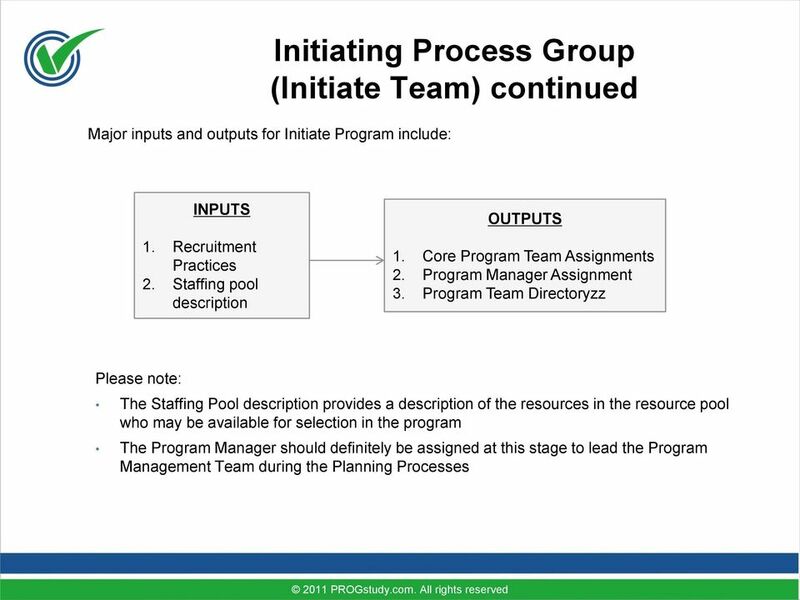 These processes involve formalizing the scope of the work to be accomplished by the program and identifying the deliverables that will satisfy the program's goals. 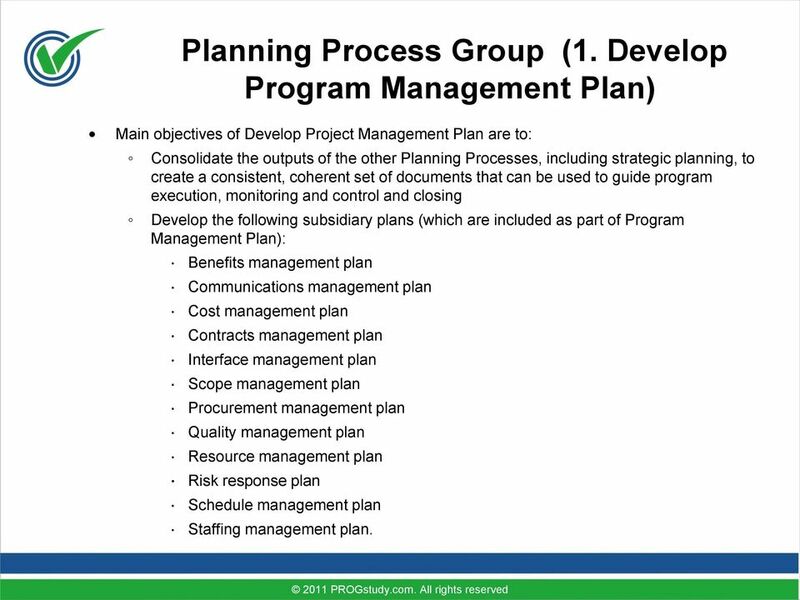 The most important output of the Planning Process Group is the Program Management Plan, which defines how the program will be carried out. This also includes all the other subsidiary plans created as part of the planning process group. 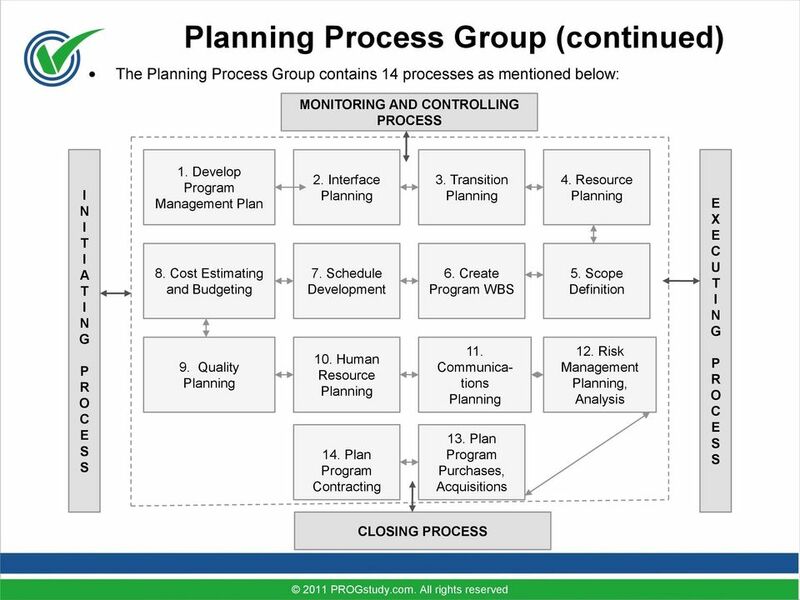 16 Planning Process Group (1. Develop Program Management Plan) Main objectives of Develop Project Management Plan are to: Consolidate the outputs of the other Planning Processes, including strategic planning, to create a consistent, coherent set of documents that can be used to guide program execution, monitoring and control and closing Develop the following subsidiary plans (which are included as part of Program Management Plan): Benefits management plan Communications management plan Cost management plan Contracts management plan Interface management plan Scope management plan Procurement management plan Quality management plan Resource management plan Risk response plan Schedule management plan Staffing management plan. 20 Main objectives of Transition Planning are to: Planning Process Group (3. 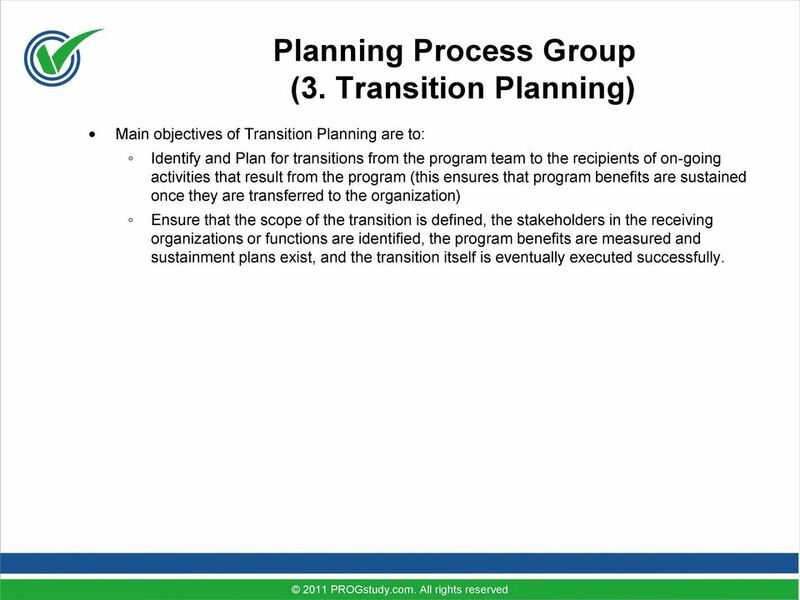 Transition Planning) Identify and Plan for transitions from the program team to the recipients of on-going activities that result from the program (this ensures that program benefits are sustained once they are transferred to the organization) Ensure that the scope of the transition is defined, the stakeholders in the receiving organizations or functions are identified, the program benefits are measured and sustainment plans exist, and the transition itself is eventually executed successfully. 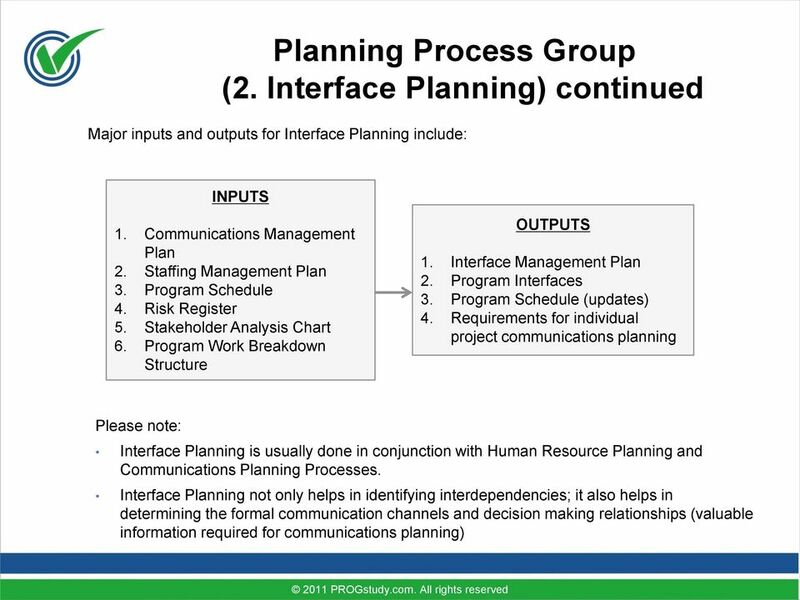 23 Planning Process Group (4. Resource Planning) continued Major inputs and outputs for Resource Planning include: INPUTS 1. Program Schedule 2. Resource Pool Description 3. Program Scope Statement 4. Program Work Breakdown Structure (PWBS) OUTPUTS 1. Resource Management Plan 2. Resource Requirements Please note: In Resource Planning, priority should be given to those skills that are critical to the program but are not possessed by any program team members. 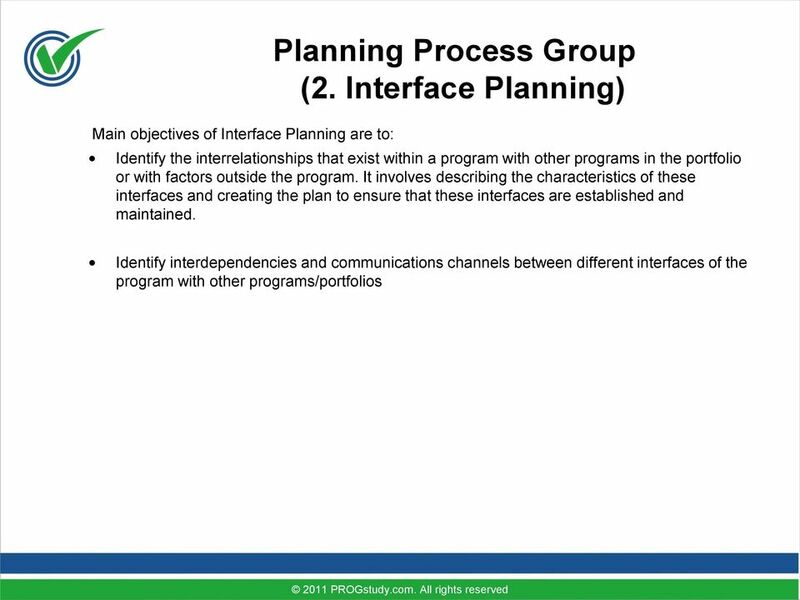 25 Planning Process Group (5. Scope Definition) continued Major inputs and outputs for Scope Definition include: INPUTS 1. Program Charter 2. Benefits Realization Plan 3. 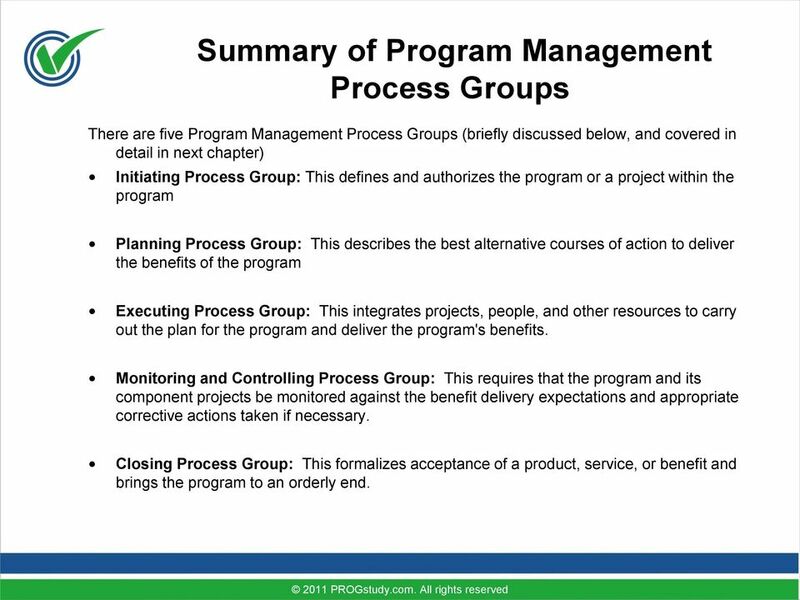 Preliminary Program Scope Statement OUTPUTS 1. Program Scope Statement 2. Scope Management Plan Please note: Scope is progressively elaborated i.e. we may have less information about scope early on by the scope will be better defined at the later phases of the program. 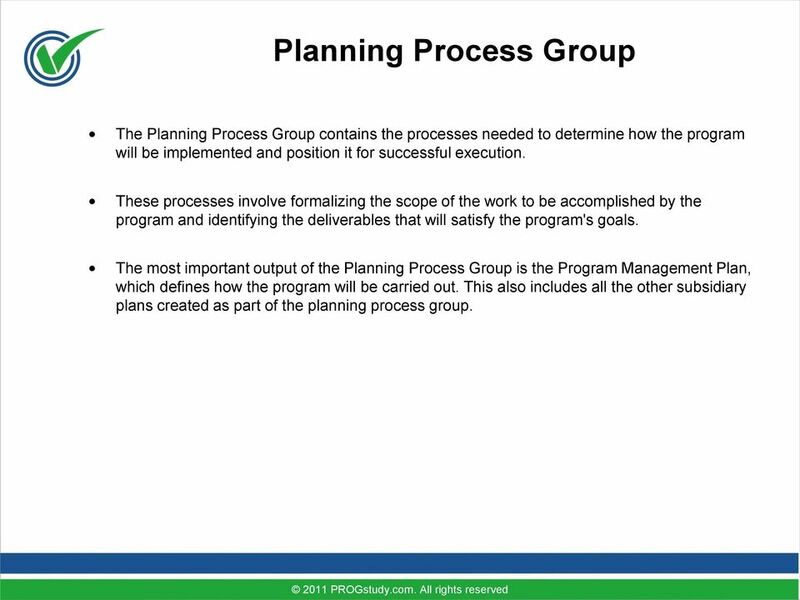 27 Planning Process Group (6. Create Program WBS) continued Major inputs and outputs for Create Program WBS include: INPUTS 1. Scope Management Plan 2. Program Scope Statement 3. Benefits Realization Plan OUTPUTS 1. 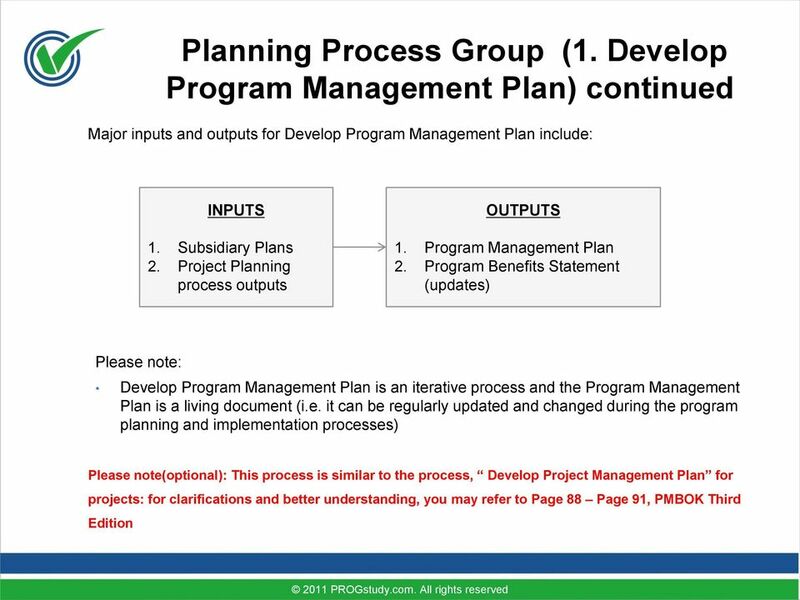 Program Management Plan(updates) 2. Program Work Breakdown Structure 3. Program Work Breakdown Structure Dictionary(PWBS) Please note: The PWBS components at the lowest level of the PWBS are known as program packages. The PWBS Dictionary (which is an integral part of the PWBS) contains the complete description of the PWBS components and any additional relevant details. 31 Planning Process Group (8. Cost Estimating and Budgeting) continued Major inputs and outputs for Cost Estimating and Budgeting include: INPUTS 1. Basis for Estimates 2. Funding Availability 3. Program Work Breakdown Structures (PWBS) 4. Resource Management Plan 5. Contingency reserve amount determinations OUTPUTS 1. Cost Management Plan 2. Program Budget Please note: Cost Estimating and Budgeting is done either by the program team for the entire program or aggregated based on individual estimates of projects and work packages. 33 Planning Process Group (9. Quality Planning) continued Major inputs and outputs for Quality Planning include: INPUTS 1. Environmental Factors and Legislation 2. Product Description 3. Program Scope Statement OUTPUTS 1. Operational Definitions 2. Program Cost of Quality 3. Quality Checklists 4. Quality Improvement Objectives and plan 5. Quality Management Plan 6. Quality Metrics Please note: Quality Planning must happen early in the program to ensure that the competency is available during the planning stages of critical program activities and processes. 37 Planning Process Group (11. Communications Planning) continued Major inputs and outputs for Communications Planning include: INPUTS 1. Communications Requirements 2. Program Reporting Requirements 3. Program Charter 4. Program Scope Statement 5. Program Work Breakdown Structure (PWBS) 6. Stakeholder Analysis Chart OUTPUTS 1. Communications Management Plan 2. Communications Technology Requirements Plan Please note: Proper communications requirements must be conveyed as input to the projects to ensure that information capture from the projects is fed back into the program. 41 Planning Process Group (13. Plan Program Purchases and Acquisitions) continued Major inputs and outputs for Plan Program Purchases and Acquisitions include: INPUTS 1. Program Scope Statement 2. Program Charter 3. Program Work Breakdown Structure (PWBS) 4. Resource Management Plan 5. Stakeholder analysis chart OUTPUTS 1. Contract Statement of work 2. Make-or-buy decisions 3. Procurement Management Plan 4. 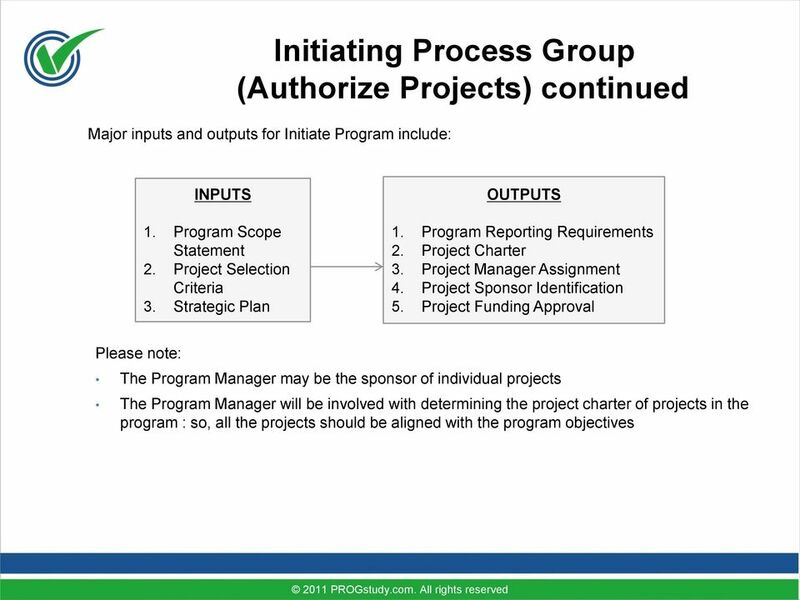 Program-specific qualified vendor list Please note: This process precedes the Plan Program Contracting Process and generates several outputs that become inputs to contract planning. 43 Planning Process Group (14. Plan Program Contracting) continued Major inputs and outputs for Plan Program Contracting include: INPUTS 1. Procurement Management Plan 2. Contract Type 3. Legal Requirement of Contracts 4. Contract Statement of work OUTPUTS 1. Evaluations Criteria 2. Procurement Documents 3. Contracts Management Plan Please note: For a program, the range and complexity of documentation for contracting will be far greater than for a project. For example, most often contracting at the program level needs to address legal issues and considerations. The purpose of this course is to provide practical assistance for defining and managing project scope. 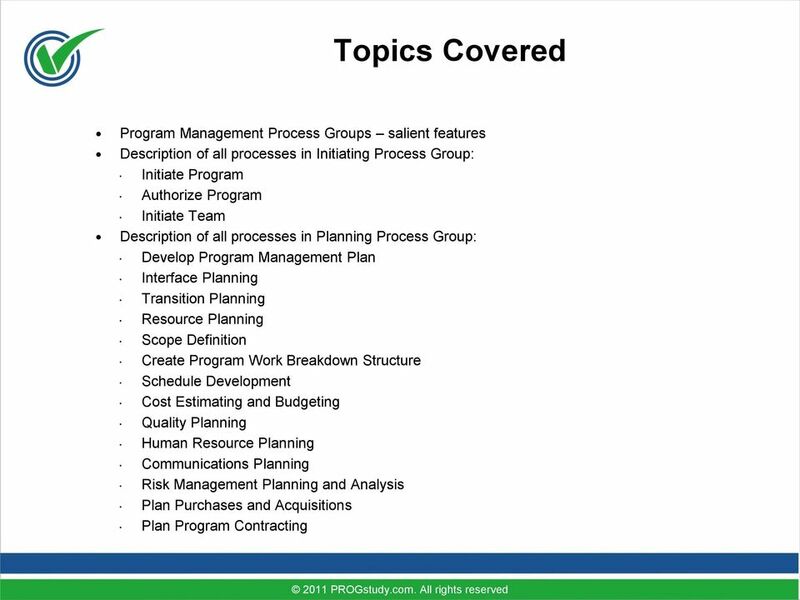 Ten Steps to Comprehensive Project Portfolio Management Part 3 Projects, Programs, Portfolios and Strategic Direction By R.